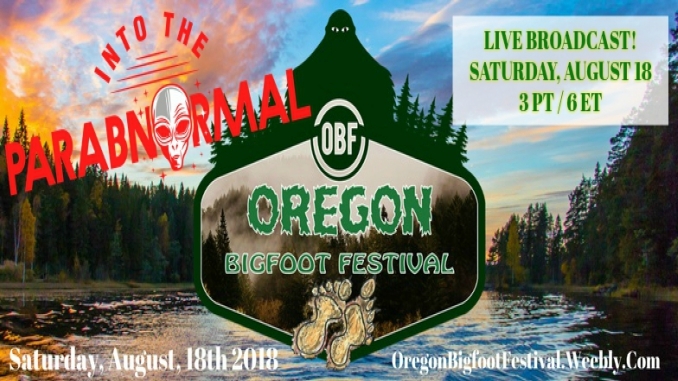 Join “Into The Parabnormal” with Jeremy Scott for a live broadcast from the Oregon Bigfoot Festival at Glenn Otto Park in Troutdale, Oregon on Saturday, August 18th at a special time of 3pm PT / 6pm ET. We’ll speak with Cliff Barackman, the Bigfoot Beast Mode Show featuring Mel Skahan, Bob Gimlin and more! Co-organizer J.C. Mercer Jr. joined us recently on the program to preview the event. For information on the event, go to OregonBigfootFestival.com. Things are about to get… squatchy! I tell Big Foot stories, I heared from my dad & respected Klamath Elder. Come to the festival… we’ll put you on.